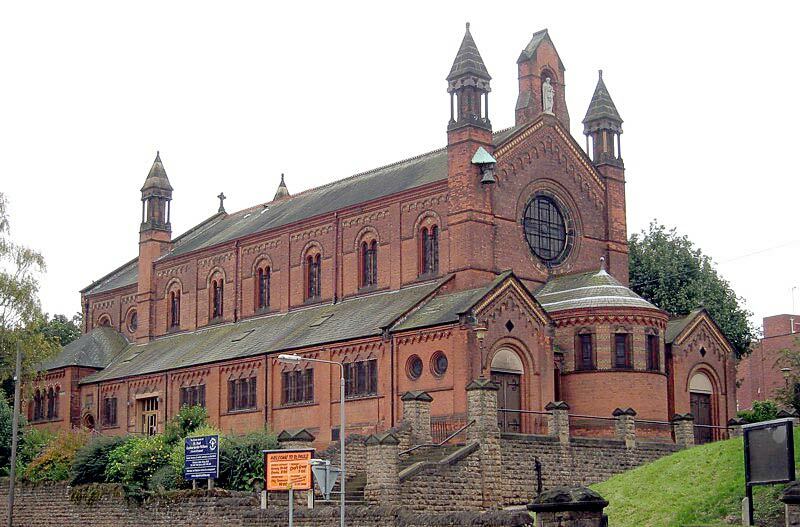 Carlton was formed into a parish separate from Gedling in 1883. The red-brick church (with yellow stone dressings) was built in two phases between 1885-91 in the style of a massive Romanesque basilica. It was designed by London architect W A Coombs. The building consists of a chancel with apse forming the sanctuary, north and south porches and western turrets, in one of which hangs a bell. The porches lead into the aisles. There is a nave of six bays with a western apse forming a baptistery. There is much moulded terracotta decoration. The inscription for the choir seats was by Eric Gill in 1903. After completion in 1891 the church was consecrated as a memorial to the 4th Earl of Carnarvon, who gave the site and £9,000 towards the cost. Particular thanks to Tim Southall for research on this entry.